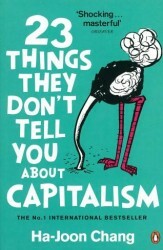 Ha-Joon Chang’s 23 Things They Don’t Tell You About Capitalism turns received economic wisdom on its head to show you how the world really works. We don’t have to accept things as they are any longer. Ha-Joon Chang is here to show us there’s a better way. Where mainstream economic debate is often stiflingly narrow, Chang talks about 19th-century Germany, 21st-century China and many other points besides. Where economics is dry, this Cambridge professor delights in paradox... Chang's readers will recognise this style from Bad Samaritans and Kicking Away the Ladder, his earlier books on development economics. But 23 Things is an attempt at a more popular book, and it deserves both a wide audience and - with its discussion of industrial strategy and the relationship between state and markets - to be read by politicians hunting for new ideas. A masterful debunking of some of the myths of capitalism... For anyone who wants to understand capitalism not as economists or politicians have pictured it but as it actually operates, this book will be invaluable. While the guild of academic economists may continue to ignore maverick economic thinkers like Chang, the future of the world economy may depend on wether the rest of us pay attention. Myth-busting and nicely-written collection of essays... the best economists are those who look around at our man-made world and ask themselves "why?". Chang is one such. Has a commitment to the idea of creating economically activist citizens which I share and believe is very important.